Superbowl is known for the game and commercials and in 2012 the Superbowl was streamed live for the first time. The phenomenal response to the streaming and the ads on YouTube Ad Blitz 2012 channel is testament to the power of the online web. As noted by the YouTube blog, YouTube Ad Blitz 2012 witnessed some amazing growth on mobile devices. Mobile devices include smartphones, tablets like iPad, etc. that include numerous apps to stream. The fact that Superbowl 2012 was live streamed this time also provided the much needed exposure to many people who want to watch it on various devices that they carry around in their pockets. The smartphone and tablet revolution has changed a lot of dynamics for online marketers, with the ability to quickly consume information. Superbowl is just one example of an event where new media and a mix of mobile devices has created great ROI for companies investing properly in them. New media done wrong can undoubtedly waste money, but the way brands like Pepsi, Chrysler have trasnformed from the 1990s style plain-vanilla TV Ads to a hybrid version of ads that aim to be viral and grab eyeballs both on TV and after the event. The after-event momentum of many ads have over a period of time become more sustained thanks to mobile devices that enable sharing easily and seamlessly. The top 3 celebrity searches include (along with their brand names) – Adriana Lima (Telefora), Clint Eastwood (Chrysler) and Matthew Broderick (Honda City); Surprised that the Seinfeld – Jay Leno commercial didn’t make it to the Top 3. 6% of all YouTube traffic came from Ad Blitz – the power of YouTube is incredible but during game season Superbowl triumphs all of that in terms of viewership and reach cutting continents and not just countries. Which was your favorite Superbowl 2012 ad? Do you agree in that mobile devices are fast becoming hot destinations for brands to engage consumers. 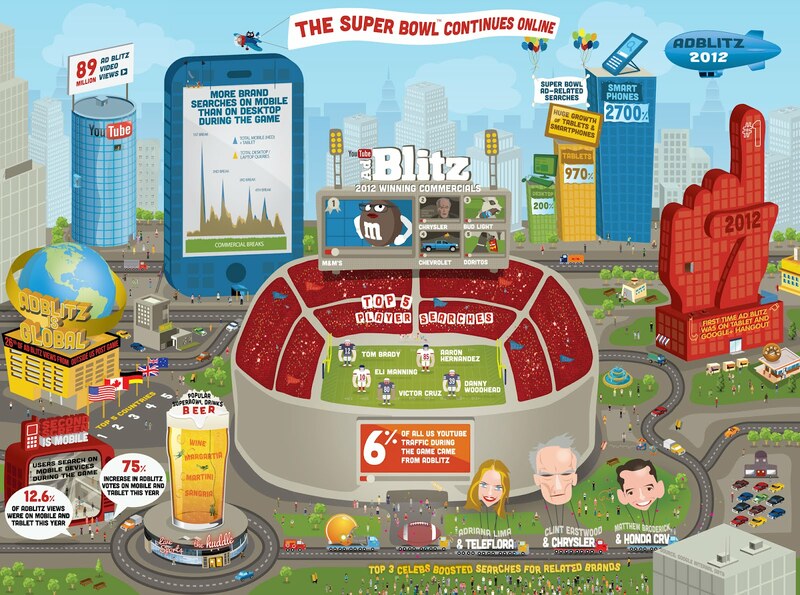 What do you think will change in the future Superbowls in terms of online marketing. Share your thoughts with our readers in the Comments Section below.